Why did I buy Leesub Sirln? Out of all of the figures released within wave 11 from the 2010 Star Wars Legacy Collection, she wasn’t even on my top three list, yet I actually went out and bought her. Sure, part of it was that when I saw the figure in the wild for the first time it was the only one from the Legacy series available, but that rarely warrants a purchase these days. To start, this is one character I had not picked on despite watching Star Wars several times. She doesn’t have even one camera shot focused on her, and the longest period she’s seen is two panning crowd scenes, at best. The background story for her was first developed by Decipher as text on a playing card for their customizable card game, not unlike Wilrow Hood, although he at least can claim to be clearly seen onscreen at one time; Leesub here is certainly taking that premise too far as a justification for producing an action figure for a background character. The outfit consists of a very short, sleeveless black and silver jumpsuit that reminds me a lot of cheesy 80’s background dancers (or current Lady GaGa attire, your pick). 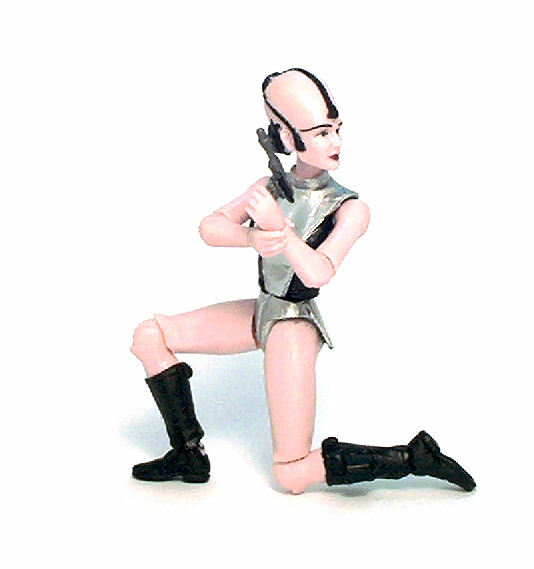 As such, there is a rather unusual (for Star Wars) amount of skin showing, a fact driven home by the bright pink plastic used for limbs and face. The face is actually well sculpted, and I dare say it is a pretty one. The lack of paint actually punctuates the fact that the factions are very delicate and proportioned, despite the giant dome on her. Leesub has some amount of hair sculpted on in the form of braids and tassels, even though there is not much texture. The garment has some seams and slight wrinkles, but there is just not a lot the sculptor could do to spice up the details there. The same is true for the limbs, which completely lack muscle definition. Granted, the proportions are correct in their depiction of a fairly generic, attractive female shape, but from the way the limbs are shaped, there is really no reason this body sculpt could not be used for a character in the more stylized Clone Wars line. • Peg & hinge elbows. These actually bend slightly over 90° and provide free sideways rotation. • Swivel wrists. Free sideways rotation. • Swivel waist. 360° swivel, although it only looks good facing front due to the costume design. • Swivel hips. Excellent 90° range, good for sitting. • Peg & hinge knees. Near 90° bend and free swivel on both knees, although the right knee is obviously sculpted pointed outwards, which limits the number of poses that look natural on it. Overall, the paint applications onn Leesub Sirln are fine, as she doesn’t have a lot of color on her and no complex paint applications are required. It is, however, an odd design choice that the ankle pins were molded in the same pink color as the bare skin pieces, as it is quite distracting surrounded by the solid black on the boots. Also, Hasbro decided to just save a fraction of a cent on the eye paint by not giving her scleras (the white on the eyes). 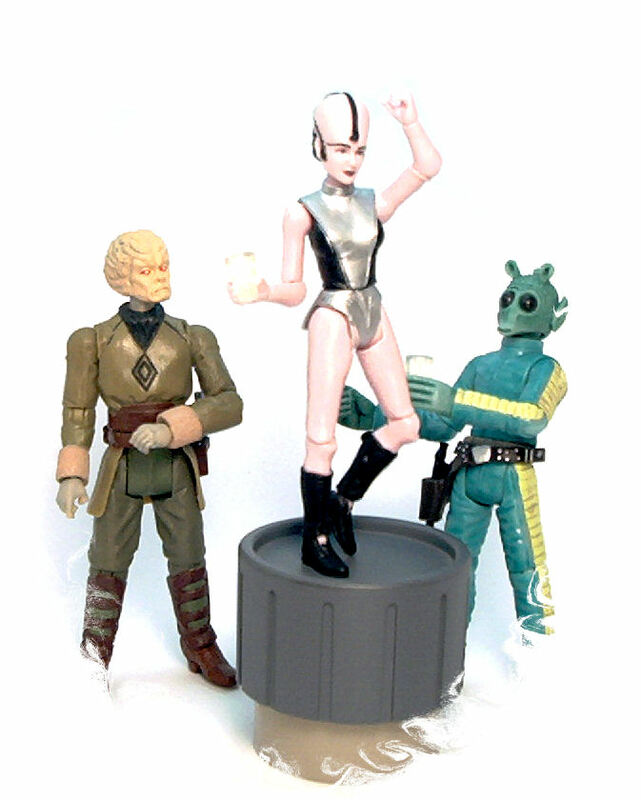 As far as accessories go, Leesub comes with a transparent shot glass, which she can hold in her right hand, and a small blaster pistol that fits in her left hand or in the holster loop sculpted at the side of her left boot. Leesub Sirln also comes with a Build A Droid piece, the left leg for R4-P44, an astromech droid from Episode III with even less screen time than her. Being this one of the collector-oriented figures in wave 11, chances of seeing Leesub re-issued in future case assortments with a different BAD piece are pretty much null. In the end this isn’t a horrible figure to get, but it’s just not very interesting to look at. 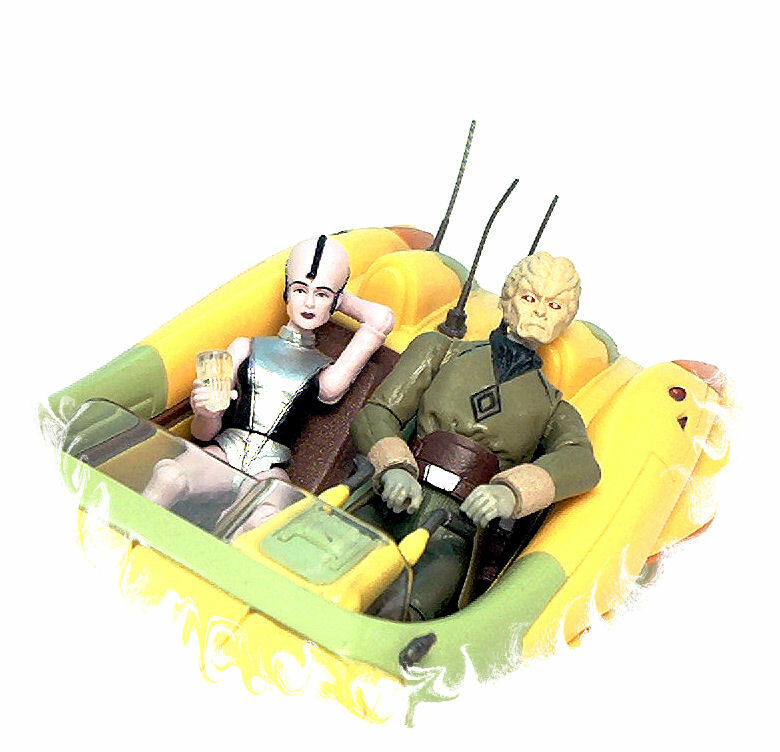 Functionally, it is a pretty good plaything, and amidst the figures in a Mos Eisley Cantina display her aesthetics are actually less jarring than, say, those of D’jas Purr or K’itik Ked Kak, so it’s all good in the end. I have to say the speeder picture and the one at the bottom both made me laugh. She turned out better than I expected. I have to say I’m more impressed that I thought I would be. And I’d agree, for as much skin as she has showing she’s a far sight better than Yarna.